Home / Disciplines and Products / Urology / Lithotripsy Database / Blog / Database / Geng JH et al, 2015: Noncontrast computed tomography can predict the outcome of shockwave lithotripsy via accurate stone measurement and abdominal fat distribution determination. Geng JH, Tu HP, Shih PM, Shen JT, Jang MY, Wu WJ, Li CC, Chou YH, Juan YS. Department of Radiology, Kaohsiung Municipal Hsiao-Kang Hospital, Kaohsiung, Taiwan; Department of Radiology, College of Medicine, Kaohsiung Medical University, Kaohsiung, Taiwan. Urolithiasis is a common disease of the urinary system. Extracorporeal shockwave lithotripsy (SWL) has become one of the standard treatments for renal and ureteral stones; however, the success rates range widely and failure of stone disintegration may cause additional outlay, alternative procedures, and even complications. 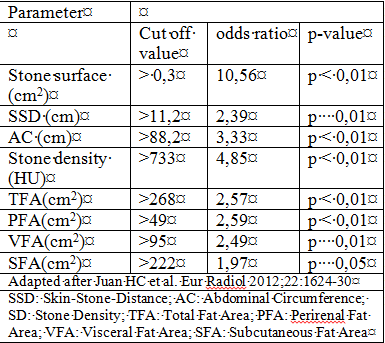 We used the data available from noncontrast abdominal computed tomography (NCCT) to evaluate the impact of stone parameters and abdominal fat distribution on calculus-free rates following SWL. We retrospectively reviewed 328 patients who had urinary stones and had undergone SWL from August 2012 to August 2013. All of them received pre-SWL NCCT; 1 month after SWL, radiography was arranged to evaluate the condition of the fragments. These patients were classified into stone-free group and residual stone group. Unenhanced computed tomography variables, including stone attenuation, abdominal fat area, and skin-to-stone distance (SSD) were analyzed. In all, 197 (60%) were classified as stone-free and 132 (40%) as having residual stone. 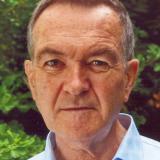 The mean ages were 49.35 ± 13.22 years and 55.32 ± 13.52 years, respectively. On univariate analysis, age, stone size, stone surface area, stone attenuation, SSD, total fat area (TFA), abdominal circumference, serum creatinine, and the severity of hydronephrosis revealed statistical significance between these two groups. From multivariate logistic regression analysis, the independent parameters impacting SWL outcomes were stone size, stone attenuation, TFA, and serum creatinine. [Adjusted odds ratios and (95% confidence intervals): 9.49 (3.72-24.20), 2.25 (1.22-4.14), 2.20 (1.10-4.40), and 2.89 (1.35-6.21) respectively, all p < 0.05]. In the present study, stone size, stone attenuation, TFA and serum creatinine were four independent predictors for stone-free rates after SWL. These findings suggest that pretreatment NCCT may predict the outcomes after SWL. Consequently, we can use these predictors for selecting the optimal treatment for patients with urinary stones. Kaohsiung J Med Sci. 2015 Jan;31(1):34-41. doi: 10.1016/j.kjms.2014.10.001. Epub 2014 Nov 6.